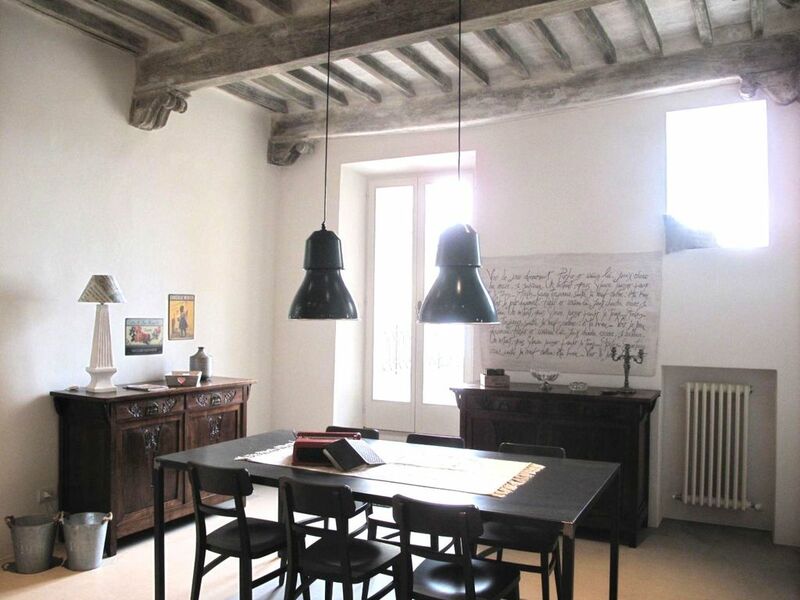 Set at the first floor of a storic building of the XV century In cerca d’Autore shows confortables rooms with singular pieces of furniture in old style revised in modern and vintage viewpoint. The apartment is characterizes by high wooden ceiling is well lighted and offers a nice terrace were you can sit and enjoy the lovely view on the green valley. Connection to WI-FI is free. Moreover as you can guess by the name In cerca d’autore we agree to innovative ideas and change the original rental's philosophy. Thanks to its central position and suggestive the residence is suitable in its living space to be also an Art-studio. Therefore if among the guests there will be artist inspired by the toscany landscape and the calm of the ancient neighbourhood they will be in the right place to reflect and create their own works like making a sketch, paint, write and compose. Outside of the apartment you are right in the centre in one of the narrow and tipical streets of Montepulciano. You can just take at walk and reach easily Piazza Grande with the Cathedral, numerous churches, the magnificent San Biagio Temple, shops, bars, restaurants, museum, wine cellars and also banks an post office. The host of the residence organize interesting tours of suggested daily itineraries in Val d'Orcia (brochure at your disposal). The news: for you, from April to November you can make workshop of Italian's culture. At the Lounge cafè La Guardiola (Monticchiello) you will be full immersed in an enchanting environment and at the same time expert teacher will give you interesting spots of italian culture or italian language!Make your reservation! !write Gessica's host!! The free area parking is near from In cerca d'Autore. Easily to get to the main artistic Italian cities: Siena, Arezzo, Firenze, Cortona, Perugia, Assisi. You can reach thermal springs: Montepulciano, Chianciano.. and the pleasant hot water in Bagno Vignoni, Bagni S. Filippo, San Casciano. Set in the heart of the historic centre of Montepulciano the apartment In cerca d’Autore offers delightful and fascinating views and spacious areas. Outside of the apartment you are right in the centre in one of the narrow and tipical streets of Montepulciano. You can just take at walk and reach easily Piazza Grande and the historic centre all. After we reserved the apartment, the owners asked us join a facebook group that makes recommendations on the best places to go in the area. This was really informative and fun. The apartment is cozy and the location is amazing. You get a feeling of being in the countryside with the gorgeous view from the large deck, while also living on a central, narrow, winding street in Montepulciano. The owners were very helpful in showing us where to park and taking our luggage up to the apartment. They created a map for us with all the good spots to eat and sample wine. The apartment itself has everything two couples on a trip could want, including a wash machine. Beyond that, the architecture and interior design are very cool. Plus, we found it super affordable. This apartment was spacious, beautifully decorated, clean, comfortable. And location was perfect. Hostess was very responsive and helpful. I hope to stay there again one day. Very comfortable charming flat in a perfect location in Montepulciano! We enjoyed our stay at gessica's! Felt like we were personal guests! Giovanna and Orazio were on hand to be sure we had everything we needed! Loved the fact that gessica's art studio was so close by. Such talent! Their recommendations for restaurants and our cooking lesson were great! Really loved Osteria Del Conte restaurant and highly recommend Massimo's cooking lesson at Le Logge del Vignola! The property is meticulously clean and well presented with everything you need in the apartment. We have stayed in many HomeAway properties and this has been our best stay. Bernardino and Gessica and the family have been truly wonderful, very friendly and helpful with many suggestions on what to do in the area and where to eat amazing food. They are excellent hosts and we thank them for our Tuscan holiday. We will miss our breakfasts in the sun on the deck and our evening wine. Easily to get to the main artistic Italian cities: Siena, Arezzo, Firenze, Cortona, Perugia, Assisi. You can reach thermal springs: Montepulciano, Chianciano.. and the pleasant hot water in Bagno Vignoni, Bagni S. Filippo, San Casciano.